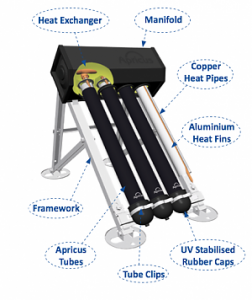 Apricus is Australia’s leading evacuated tube solar hot water supplier. An evacuated tube system means that the solar panel on the roof has multiple long tubes on it instead of a flat surface – this makes it more efficient as it can optimize its absorption of the sun at any angle. Apricus hot water systems are becoming more and more popular due to their high efficiency, lightweight and low maintenance construction. Apricus was founded in 2003 and prides itself on providing the highest quality with industry leading warranties, exceptional after sales service as well as the best price. With offices in the USA, Australia and France, Apricus supplies to more than 30 countries. Apricus systems come in varying size tubular solar panels. They have systems consisting of 22 tubes, 30 tubes and 44 tubes. They can also choose between a glass line tank and a stainless steel tank with a maximum size of 400 litres. Apricus hot water units are 30% more efficient than flat panel solar hot water systems and will save you around 80% on normal water heating costs.